If you’ve been following my IG account, you probably knew that I went back to Guam last December and that I spent most of my days shopping! Too bad we went there after Black Friday sale. Nevertheless, my husband and I scored awesome deals during our stay. Although Guam Premier Outlets (GPO) and other discount stores in Guam have limited offerings as compared to massive outlet stores in mainland US (such as those in California and Nevada), you can still get awesome deals when you go to Guam. First, flights going to Guam from the Philippines are more affordable as compared to airline tickets going to mainland US. 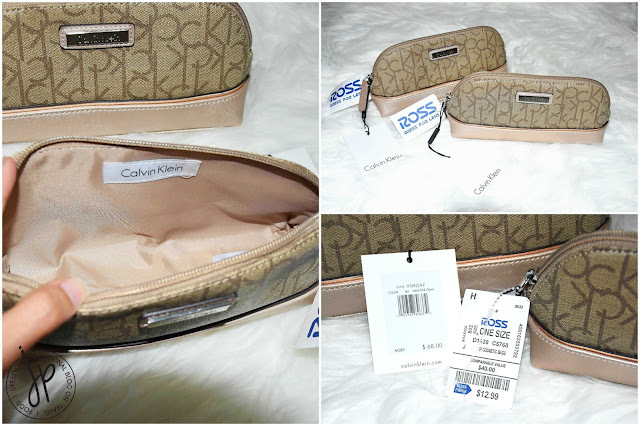 Second, you can be sure that you’re buying genuine items straight from the store. Third, you don’t need to pay an additional tax at the counter when purchasing goods. So just like in the Philippines, whatever’s on the price tag, that’s just what you're going to pay! About a third of these 45 items were holiday presents for my family and relatives, while the rest are for me and my husband. I’ll include the original retail price (if any) and sale price, as well as the stores where I bought all of these. Prices are in US dollars. Let’s begin! 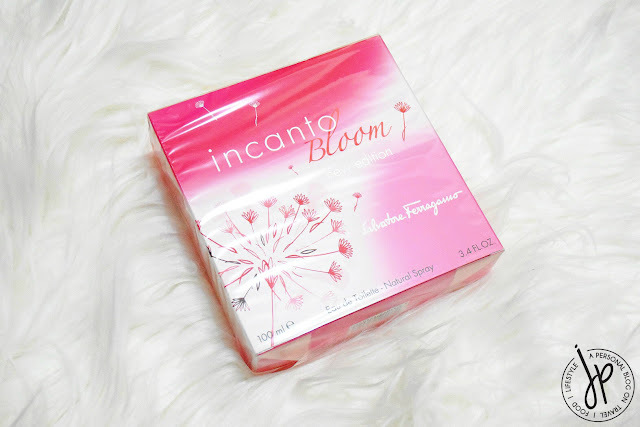 This perfume was on Buy 1, Get 1 at 50% off sale. My mother bought her favorite Burberry perfume and I bought this one at half the price for my mom-in-law’s birthday. 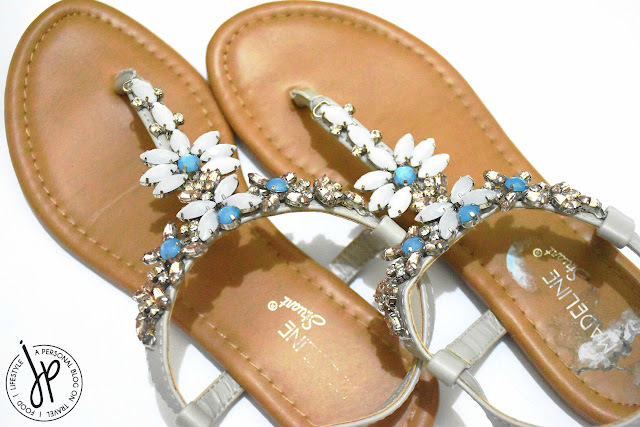 I was looking for a pair of girly sandals and saw these jeweled ones from Madeline Stuart. I’m not familiar with the brand, but I find this pair to be comfortable and stylish at the same time. I wasn’t able to bring a pair of sandals with me during our trip; so as soon as I saw my size, I just had to grab it! (Please excuse the sticky remnants from the size marker and price tag on the right). 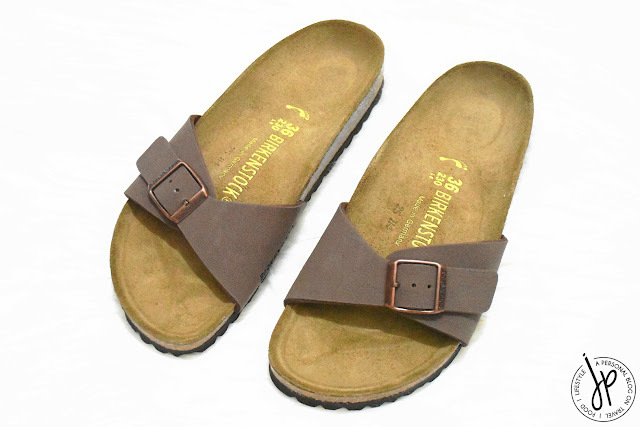 The sandals have buckled straps which I prefer over the garterized straps commonly seen here in the Philippines. 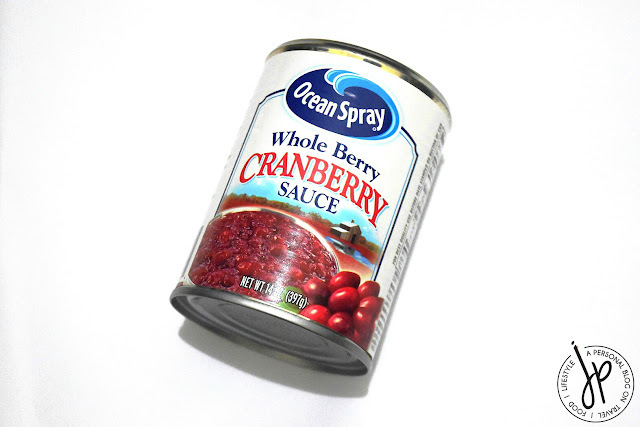 I’ve been looking for a can (or jar) of cranberry sauce here in the Philippines, but it’s hard to find one. Good thing I saw this at the supermarket and I immediately dropped two cans in my shopping basket. I already used the first can and to be honest, I didn’t like it, maybe because I still had to mix in other ingredients in order for me to get my preferred taste and consistency. 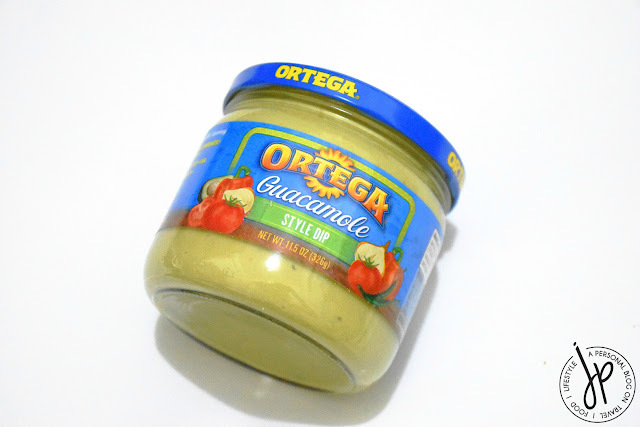 We shopped for chips on our first night in Guam and spotted this Guacamole Style Dip from the brand Ortega. I wasn’t sure if this was the best-seller, but out of all the dips in the shelf, this one only had a few stocks left. I don’t make my own guacamole so I’m pretty sure this wouldn’t be as good as the real one. However, I liked it with my chips. And so I went back and took home another jar! 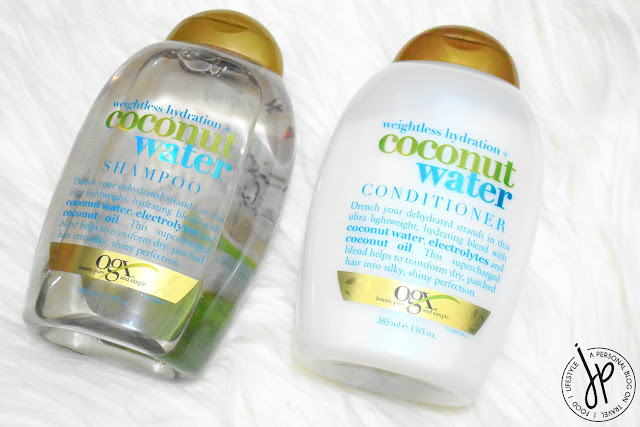 If you’ve been reading my blog, you know that OGX is one of my most repurchased beauty products. The brand started to increase their prices here in the Philippines from Php500 to Php549 per bottle! And so when I went to Guam, OGX was on top of my list. I wasn’t able to find the variant that I want, but I picked this coconut water variation as it’s meant to hydrate and charge dry and parched hair. I am currently using both shampoo and conditioner and I love them, too! I like the mild scent of coconuts and the tropical feel while in the shower. 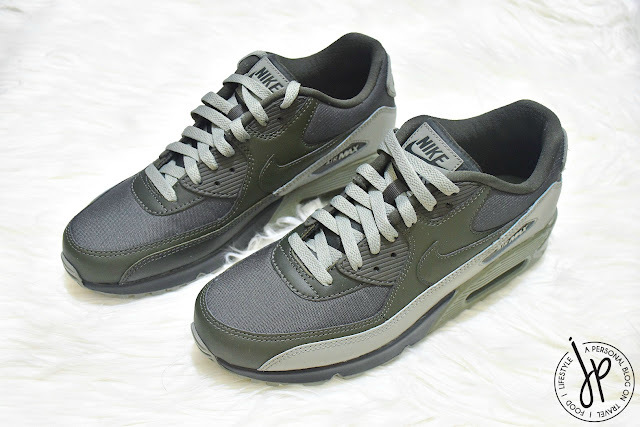 In my husband’s shopping list is a dark-colored Nike Air Max that he can use as his daily work shoes. He only has one pair of Nike Air Max (which I bought in Macau two years ago) and he used that pair almost everyday because it’s the perfect “pang harabas” shoes (as he calls it). Because the rubber sole has such a decent height, the shoes can withstand rain and puddle, preventing water from seeping into his socks and feet. 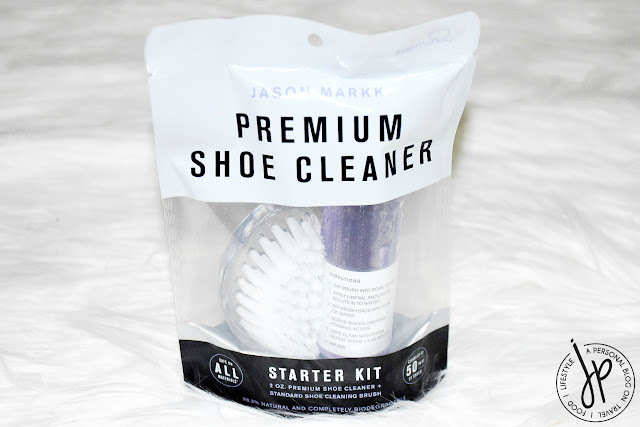 I’ve heard about the Jason Markk shoe cleaning brand from one of my sneakerhead friends. When we saw there were only two kits left, my husband bought one pack. We haven’t opened this cleaning kit yet, so we shall wait and see if it’s worth the hype. 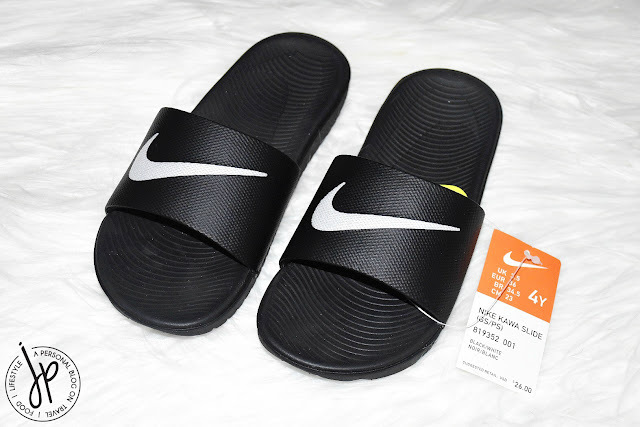 I’ve always wanted to get a pair of slides either from Nike or Adidas for times when I need to run quick errands at the mall or nearby stores from my house. However, there aren’t many stocks left in my size in Manila (plus the designs were limited). I went to the youth section of the store and found this pair. It’s. So. Soft! Without thinking twice, I immediately asked for my size. Aside from slides, I also wanted to own a pair of Birkenstock but I can’t justify paying for the full price. Birkenstock in Manila usually does promotional offers, but for classic styles and colors like these Madrid Sandals, you won’t get as much discount as you’d like. Birkenstock in Guam had a Buy 1, Get 1 at 50% off promo on ALL their sandals, so my husband and I decided to buy one pair each. He paid for the full price and I got the half price! He said I tricked him into buying his Arizona Sandals, but he just couldn’t admit how much he loves his pair (not featured in this post). 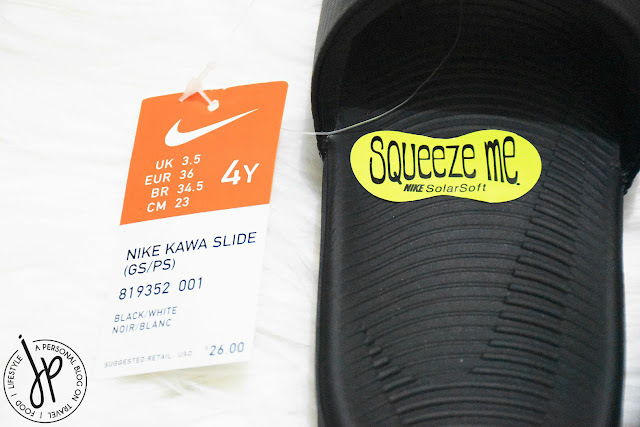 After several uses of these sandals, I realized why they’re priced as such and how comfortable and sturdy they are. 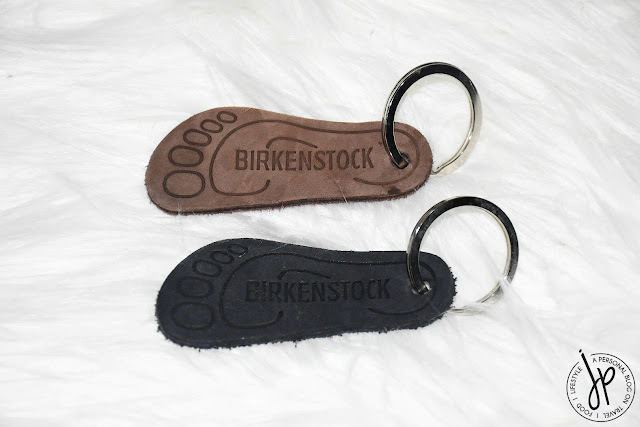 For every pair of Birkenstock sandals, the store gives these leather footprint key rings. I’m not sure if Birkenstock and Shoe Salon in the Philippines give out free key rings, too, but I do find these useful and stylish. I just love anything leather. 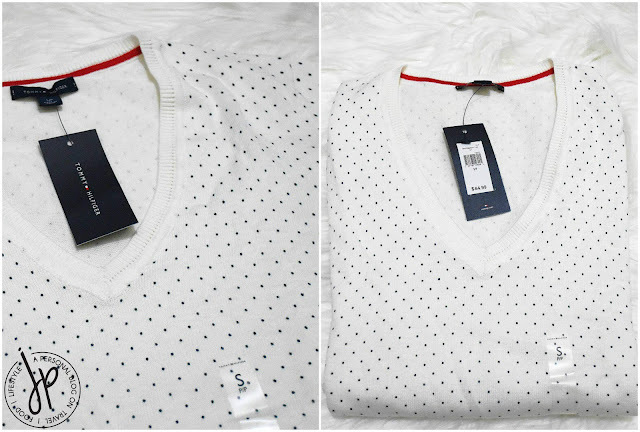 One of my Christmas gifts for my mother is a v-neck polka dot pullover which I got from Tommy Hilfiger. We usually travel to places with colder climates so I thought this is something she could wear multiple times. My mother usually wears size medium to large, but in Tommy Hilfiger I bought her a size small, as the clothing brand runs sizes from XXS to XXL. I’ve been into backpacks lately, especially when I’m traveling. 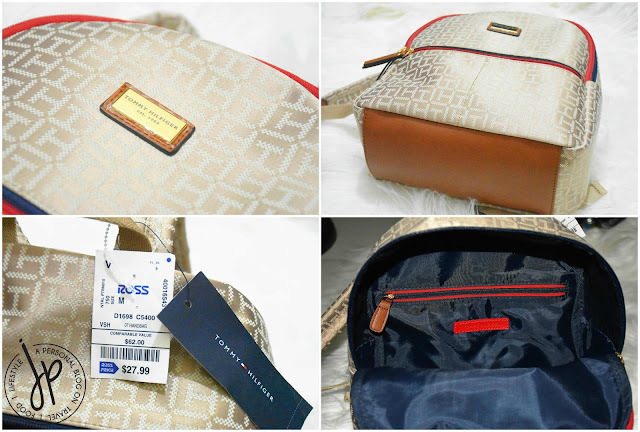 That’s why when I saw this medium-sized Jacquard Signature Tommy Hilfiger backpack, I felt like it’s the right size for my trips abroad. 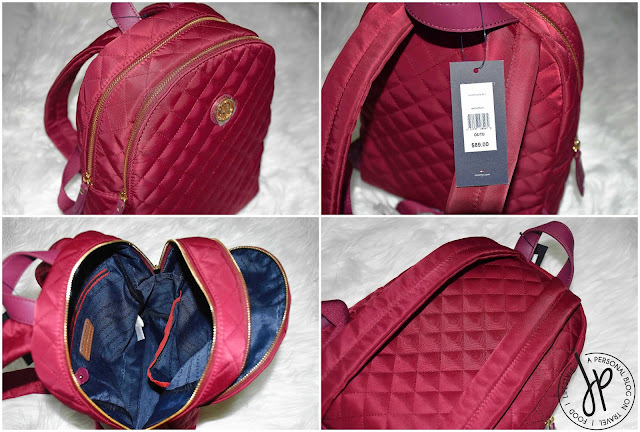 I used to carry my Longchamp Le Pliage backpack; however, my shoulders and back tend to hurt because of the weight and the straps aren’t padded. This beige one looks promising due to its padded straps and multiple pockets. I also like the faux leather trimmings, supporting the base of the bag while adding some classy details. 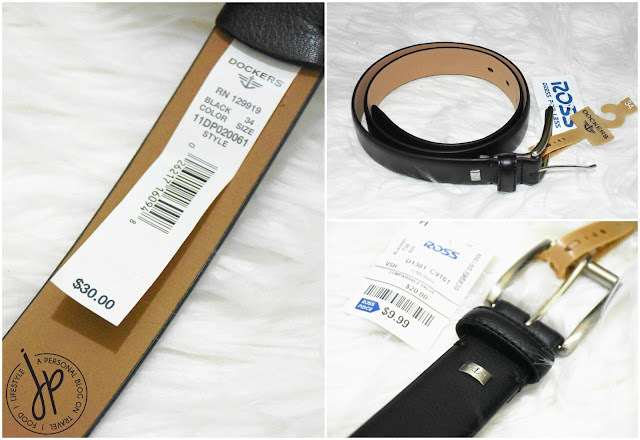 This classic black, leather belt from Dockers is our pick for my uncle, who’s also our godfather. We decided to give him a belt for Christmas, as this is something he'd reach out for everyday. Here are two pairs of women’s no show socks for my niece who’s already in her early teens. 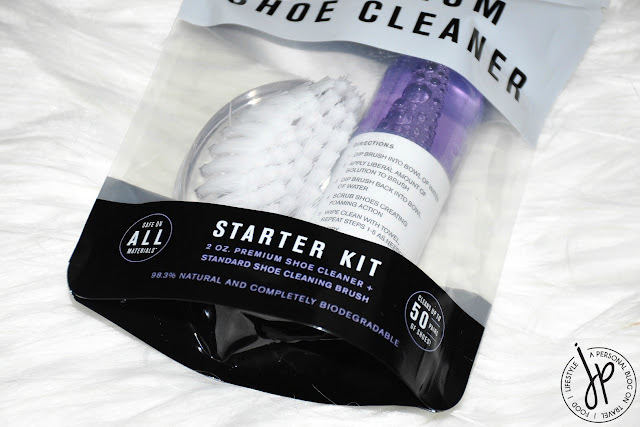 It’s not too thick, nor too thin – perfect for sneakers. 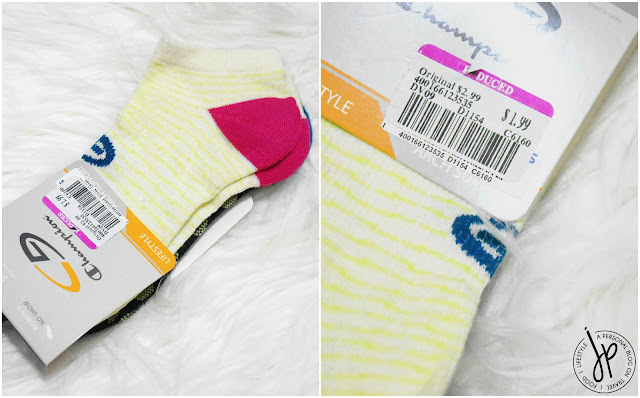 These three-pack Tommy Hilfiger socks are the softest ones I ever had! I’m not sure if these will fit me as they run quite large, but I’ll definitely use them. I’ll give the other pack to my friend for her super late holiday present. My husband had been searching for the best water bottle before we went to Guam. 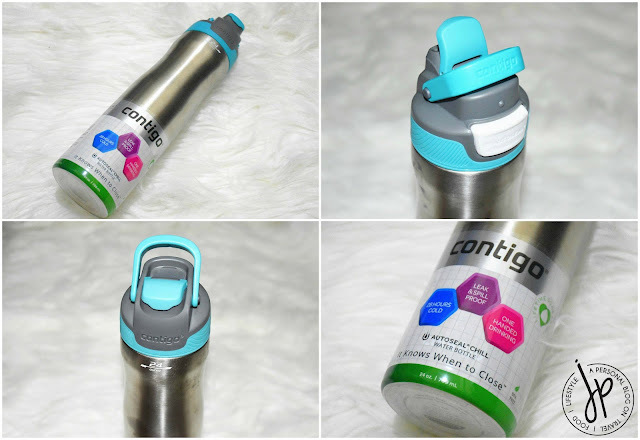 Stainless steel water bottles like this usually cost more than Php1,000 in Manila, so imagine my husband’s delight when he found this Contigo bottle at the outlet store. This one is designed for cold beverage, lasting up to 28 hours. It’s also leak and spill proof, which is perfect for my ever so clumsy husband (lol!). It holds up to 709 ml of liquid, has a handle at the top for easy transport, and a spout cover to keep away germs. 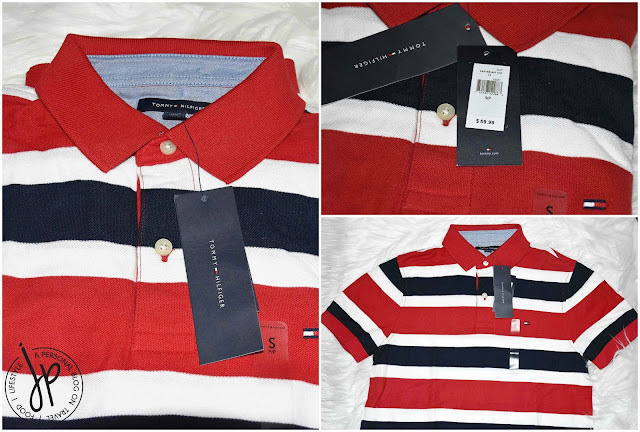 You can never go wrong with a classic fit, men’s polo shirt, especially when it’s from Tommy Hilfiger. My father-in-law usually wears polo shirts as a staple, and so this is one useful present for him. 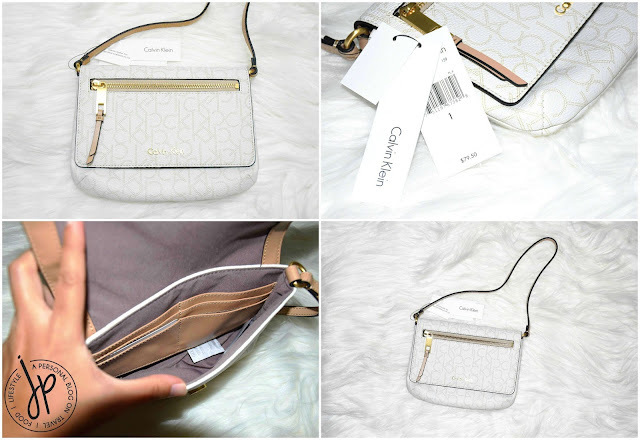 These cosmetic pouches from Calvin Klein are also one of my best purchases. If I haven’t had enough pouches already, I would’ve grabbed one for myself as a pen case. I gave these to my paternal grandmother and my husband’s maternal grandmother for Christmas. The CK pouch is made with pebbled faux leather and only has one zippered compartment. The bottom part has a metallic, rose gold lining which I find very feminine. Because the weather in the Philippines is cool at the moment, my everyday base makeup consists only of face powder, even if I have combination skin. I only own a couple of luxury lipsticks, so I decide to pick up a luxury pressed powder this time. 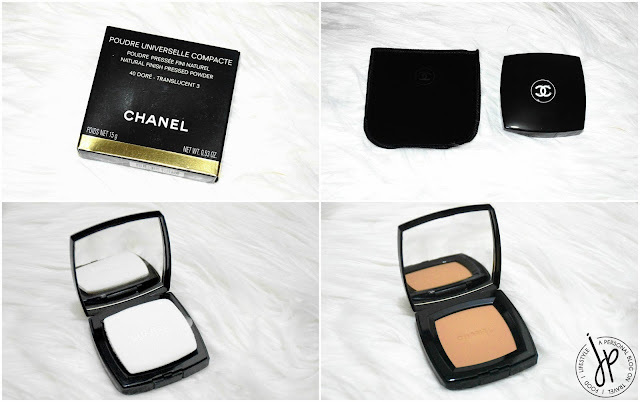 I made a thorough research on this Chanel Natural Finish Pressed Powder and based on the reviews, this one has a good staying power on the T-zone and is also perfect for touch-ups. The package says it’s a translucent powder, but I still had to choose a shade. The darkest shade is 40 Dore Transparent 3, which I think is still light for those with olive and deeper skin tones. I haven’t used this yet (still finishing my old powder), but I’ll definitely use this one next month. 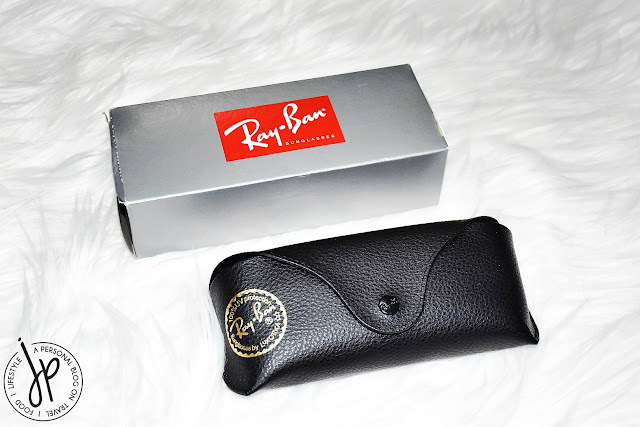 Love the sleek packaging, the posh velvet soft case, and the big mirror it comes with. I was very lucky to come across a kind and friendly sales associate at the Chanel counter so she gave me several sample items together with my purchase. I received three, 5ml sample creams which are for (1) Firming – Anti-Wrinkle, (2) Brightening and Moisturizing, and (3) Hydration. I gave the first two tubes away and kept the hydrating gel crème for myself. We shall see if this Chanel gel crème is promising. 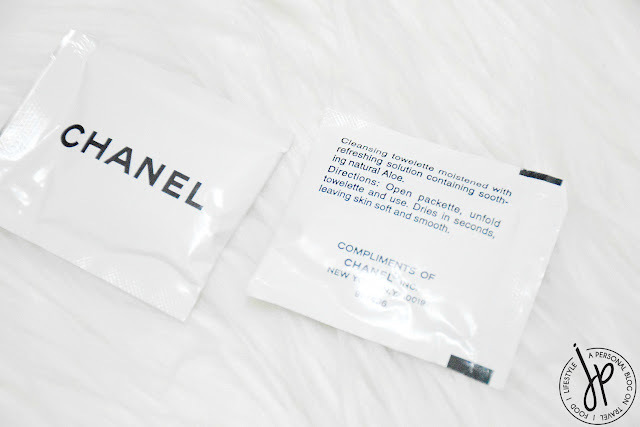 I got two cleansing towelettes from Chanel which I find very useful especially during long haul flights. I do take off my make-up before sleeping on the plane and these towelettes are very useful and travel-friendly. I haven’t opened one yet, but I hope they do smell like Aloe. I mentioned in my updated Christmas Wish List for 2017 that I skipped purchasing my holy grail mascara. 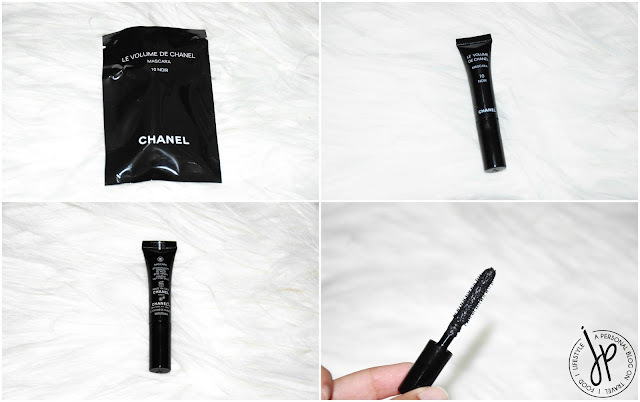 That’s because of this volumizing mascara from Chanel! I was skeptical in using this at first because of its wand. But when it comes to the formula, holy moly it’s definitely one the best I tried! The consistency is a bit thicker than most mascaras and what I love about this is that it doesn’t dry easily in the tube. My lashes are thin and short, but this one from Chanel coats my lashes evenly and makes them look thick and long. I’m honestly considering buying the full size version and I hope I can score one on my next travel. Here’s another gift for an uncle who wears polo barong for work. 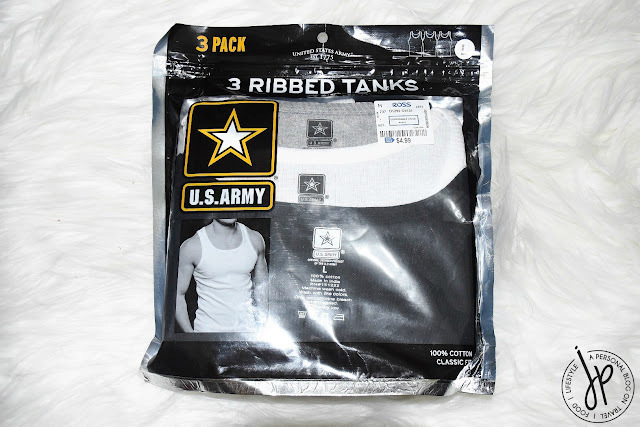 This pack of three ribbed tanks from U.S. Army can be used as an undershirt or a simple pambahay. 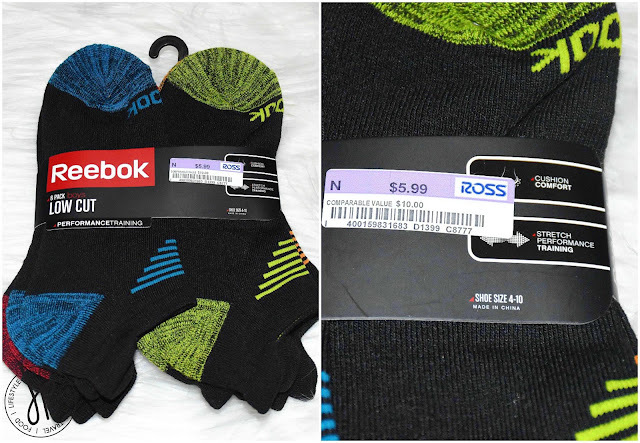 I have two nephews who are both on their early teens now, and so the best gift I could think of are these Reebok low cut performance training socks. 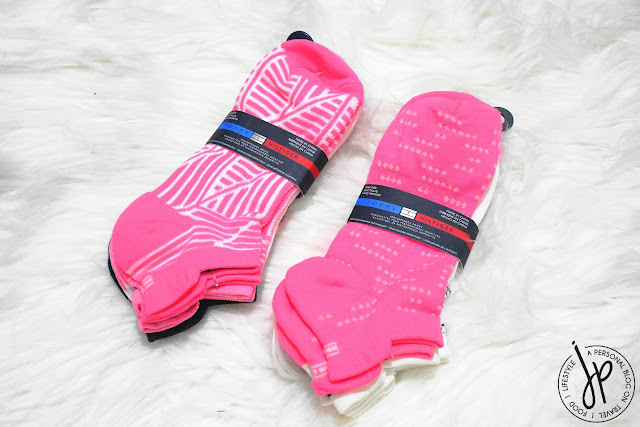 These socks have the right amount of thickness, perfect to wear with pair of running or basketball shoes. Here I am again with several socks for my nieces (lol!). How creative can I be with my holiday presents? 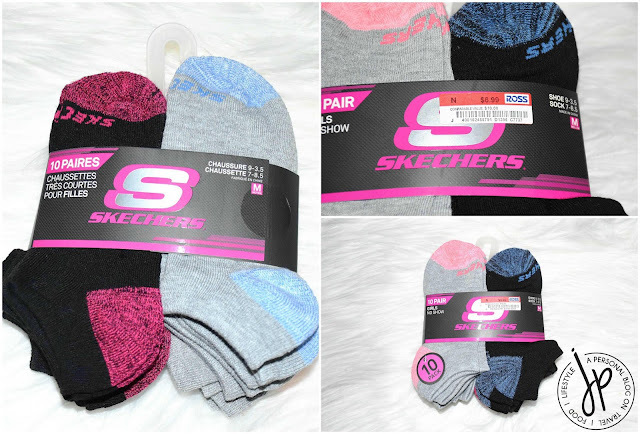 But anyway, I got them these socks from Skechers. It’s a pretty good deal, considering that the pack already comes with 10 pairs of different colors and designs. I always carry a number of no-metal elastics with me, which I usually buy from Nouveau and Forever 21. Even if I buy a bunch of them, I end up losing some hair ties or throwing them when they get worn out. I rarely buy from Goody because although it’s a trusted brand for hair tools and accessories, the price is very expensive in the Philippines. However, my husband felt generous during our nth trip to the store so he bought me a pack of these Goody Ouchless No-Metal Elastics. So far I didn’t find much difference between the Goody ouchless hair tie and the similar counterpart from Nouveau and Forever 21 when it comes to holding my hair in place. 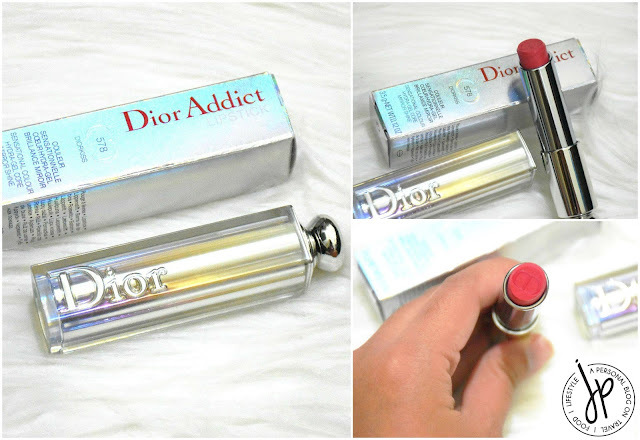 Dior Addict Lipstick is currently one of the best reviewed formulas in the luxury lipstick department. Because my mother isn’t fond of wearing lipsticks (mostly just tinted lip balm), I got her this Dior Addict Lipstick in 578 Diorkiss (the Kate Moss shade), which is more of like a gel-balm consistency. It’s one of the best-selling shades as this was the only stock left. It has a warm pink color that goes on sheer on the lips and keeps the lips shiny and moisturized. 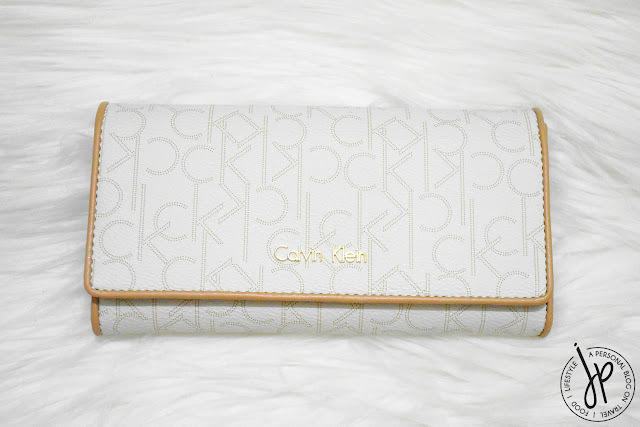 My husband chose this Calvin Klein long wallet as our Christmas present for his mother. 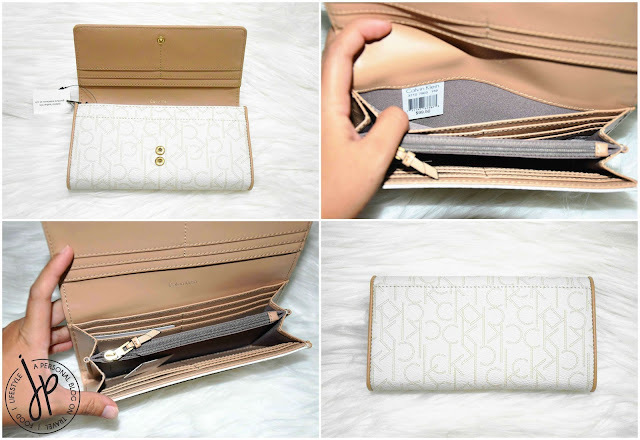 It has the signature CK jacquard print and has plenty of card slots, several bill partitions at the interior compartment, a large zippered section for coins, and an exterior slot for cash and receipts. This design is also one of their new releases. I went to the store and I fell in love with this small purse, but didn’t buy it right away. I couldn’t get it off my mind so I went back and purchased it the next day! 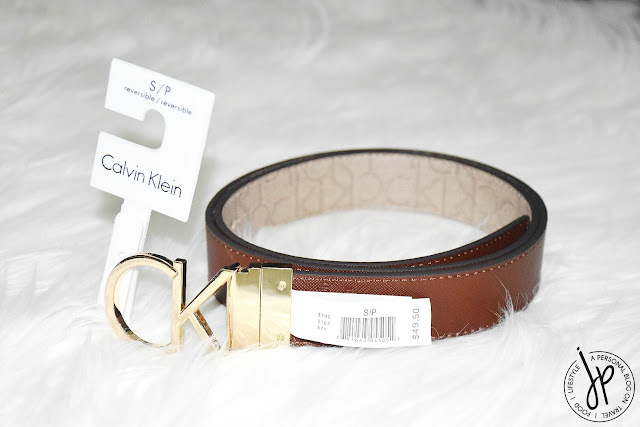 I love this small CK purse as it’s the perfect accessory to put in cards when I want to downsize my stuff. My iPhone 6s fits in here perfectly, that’s why I adore it so much. It came in several colors and designs, but I chose this simple white, CK monogram print which looks clean and classy. 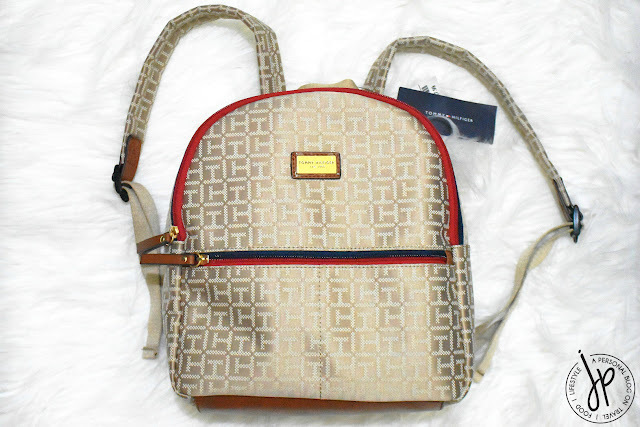 Here’s another backpack which I scored at Tommy Hilfiger. This one is smaller than the beige one and I find myself gearing towards this for everyday use. I like that it’s in a deep red shade so it doesn’t get dirty easily. 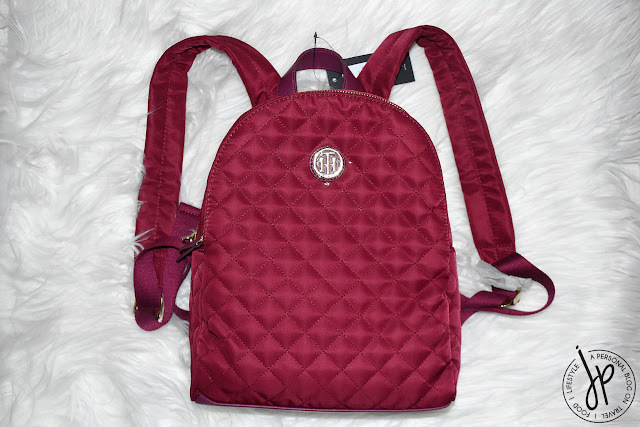 It has padded straps, two zippered compartments, and two inner pockets. For its numerous compartments, the bag itself still looks compact. Aside from backpacks, my other go-to bag is a crossbody bag. 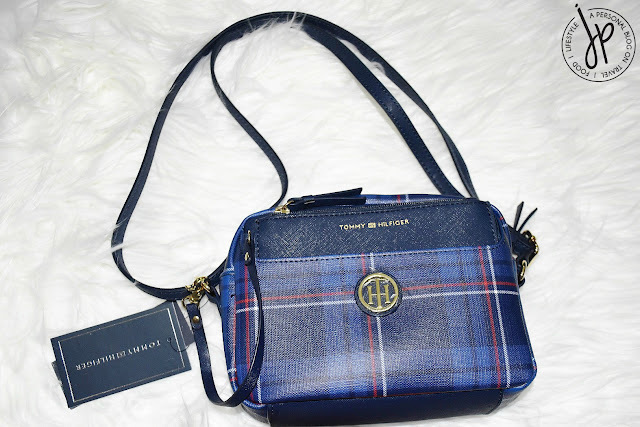 I’ve downsized all my stuff for the past year and so when I found this Tommy Hilfiger camera bag-type crossbody bag, I felt like I’ve seen a gem in the midst of all the discount bags in the outlet store. I love the design, the color, and the option for a detachable pull-out pouch. Inside is an open pocket and a three-slot card compartment, which I find useful for easy access. I had countless non-Apple branded lightning to USB cables in the past and none of them lasted beyond 4 months. 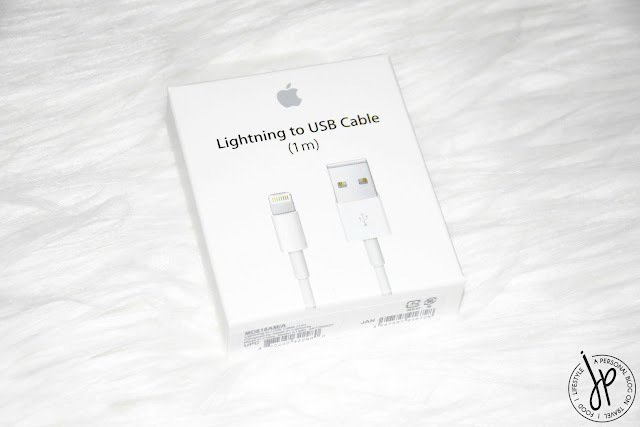 Because of that, I wanted to purchase a genuine Apple cable in the 1 meter length, but the specific size is always sold out and much expensive here by Php300. I found this cable in Guam and stored it in my go-to cable pouch as an extra cable for whenever I use my power bank. I use my older cable from my iPhone kit for home charging. As I grew older, I became a very jeans-and-shirt kind of girl. I like basic tops and reusable pieces which I can mix and match (less on the trendy side), and so one way to accessorize is by adding a belt on my ensemble. 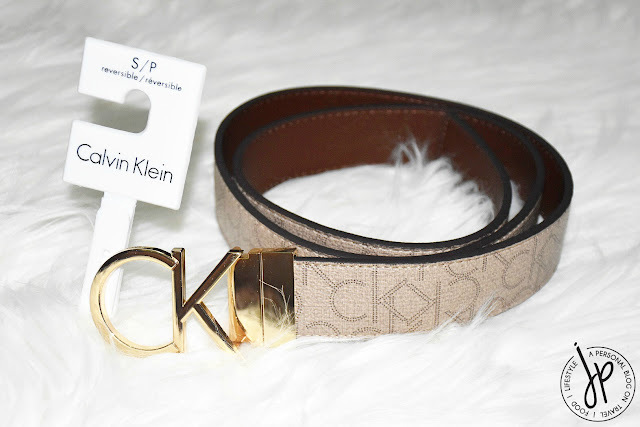 This reversible belt from CK is one of my favorites from my shopping spree because it has the right width, a plain dark brown side, and a CK monogram print on the other. Two belts in one! I’ve always wanted a pair of Wayfarers but it just doesn’t fit my face! It either slides off my nose bridge or the lens hit my cheeks. 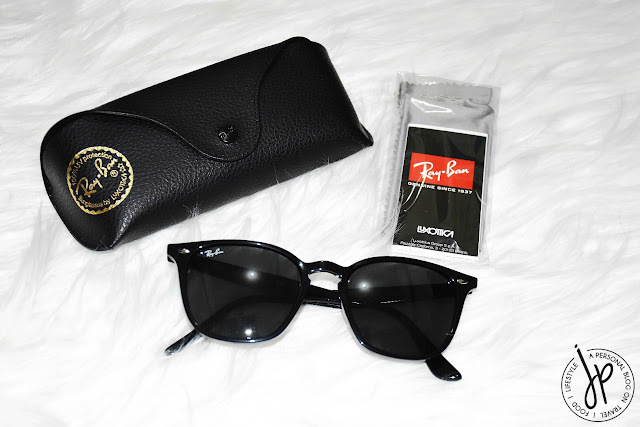 I still can’t justify purchasing Ray-Bans that are worth more than $200, so I thought I’d try this one first. It isn’t one of the popular designs, but I like how it fits the frame of my face. I picked the one in black, but there’s also another one in brown. 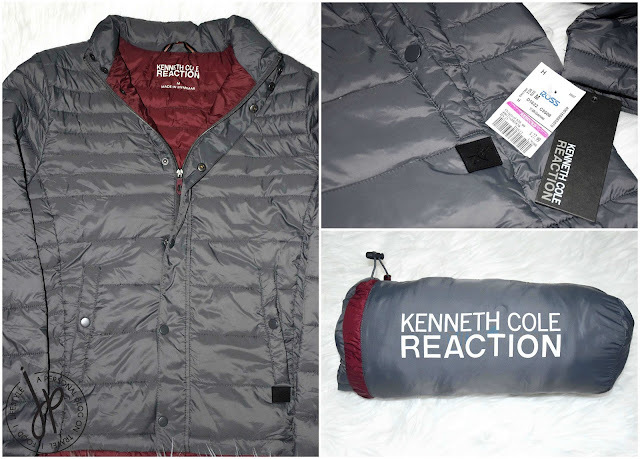 My husband rarely buys quilted jackets, but when he saw this packable jacket from Kenneth Cole Reaction in his size, he threw this in his shopping cart right away. It’s very lightweight and in the color he likes. Our hotel in Guam had some serious ventilation problem, so I wasn’t able to dry my washed clothes. 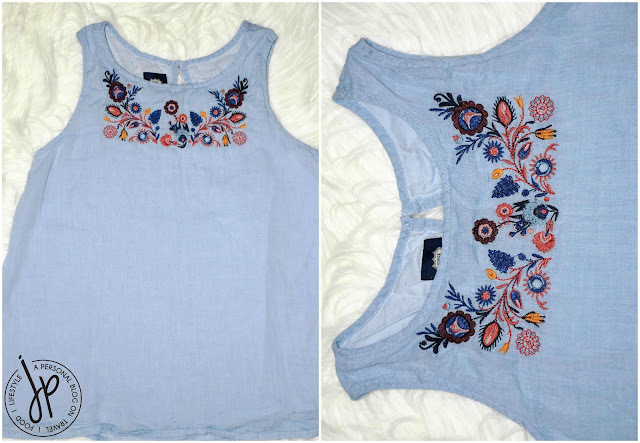 I only had limited clothes for our entire stay, so I purchased this sleeveless embroidered top from the girls’ section (haha!). The small size in the women’s department still runs a bit big to me, so I picked the largest size from the girls’ clothing area (size 12 or 14, I think). This is another emergency purchase for the lack of clean and dry clothes. I went to Ross, Kmart, Levi's, and Tommy Hilfiger, but I felt like the bottoms were still expensive for the quality and design. 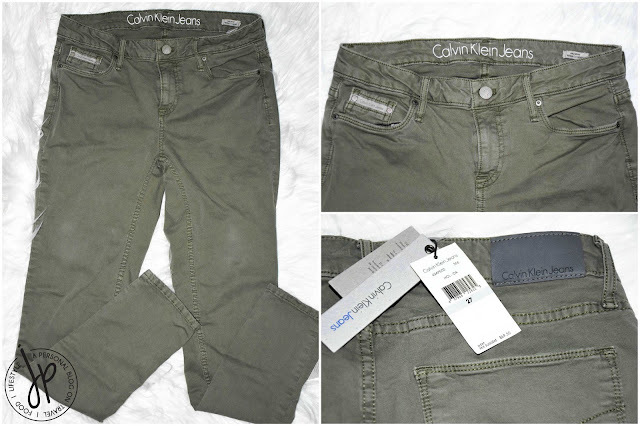 I went over to Calvin Klein and picked this olive colored CK pants at the clearance section. I was so thrilled that with the minimal stocks left, I found this last pair that fits me well! 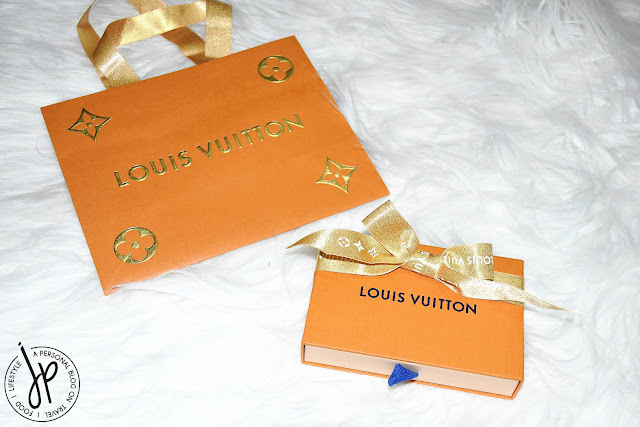 Finally, my last purchase from my Guam shopping spree is this key pouch from Louis Vuitton. I want another Damier Ebene print for my SLG collection (plus I adore the limited edition holiday paper bag haha! 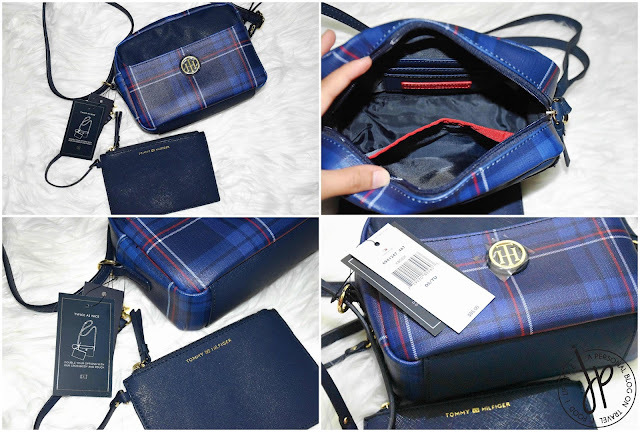 ), and a small purse to put keys, maximum of three cards, as well as bills and coins. 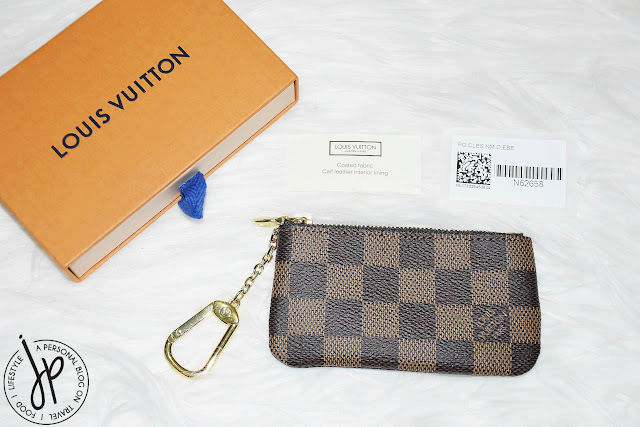 This is a great luxury starter piece from LV that still holds value even after several years. Did you enjoy reading my Guam shopping spree? I hope this helps you decide on booking your next trip to this lovely island. 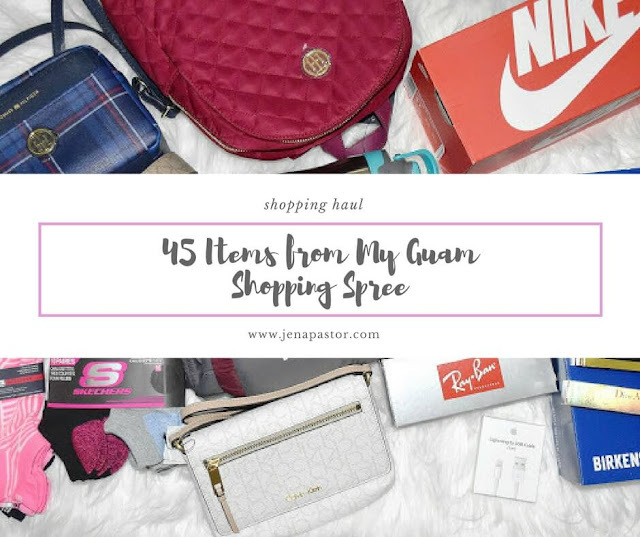 Read my next post for some Guam shopping tips!